Coupon codes allow trainers to order Style Matters Online for multiple users and pre-pay for them. We'll send you an Access Code by email as soon as you place your order, good for a set number of users. You email instructions for login with the Access Code to your users. Easy to get your users to the inventory. All you do is send one email to your users! Easy to track exactly who has taken the inventory. Coupon manager page records all users. 2. Follow instructions there to enter your name, email, password, and access code, which is: [ACCESS CODE HERE]. The code is not case specific. You can type it by hand or copy and paste it from this email to the login. Then click Login to Style Matters. 3. "Welcome to Style Matters" displays on your screen. You're there! Just follow instructions. It takes about 10-15 minutes to take the inventory. You will see your score report as soon as you've finished taking the inventory and you will also receive it in your email. Please print out a copy and bring it to our session on (DATE OF YOUR TRAINING SESSION)." That's it! Your users will take it from there and arrive in your workshop with a printout of their score report in hand! 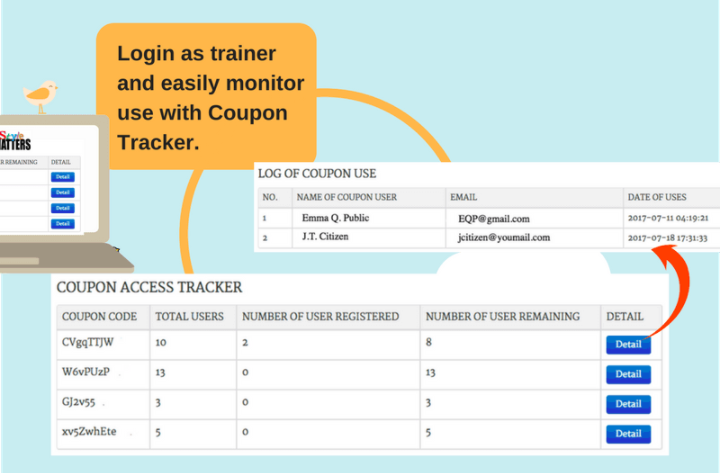 As trainer, you'll have a Coupon Manager page on our site that shows exactly who has taken the inventory at any time. As shown in the infographic below, if you've ordered more than one coupon you can see how many uses each has had. By clicking on the Detail button you can see name and email of each user.